We had breakfast at 8:00 am in the hotel and then got on the bus to go to Pompeii at 9:00 am. Several of our precious lambs, (Singers) have been sneezing, coughing, and going through an early spring allergy season all over again! It’s really crazy how much a new environment can affect our allergies! Pompeii is an ancient city that was destroyed by a volcanic eruption in 79 AD. Mount Vesuvius erupted and spread ash and gasses over the city of Pompeii trapping and killing all of the residents and their livestock. The city was buried in ash and was forgotten for nearly 2000 years when some explorers rediscovered the site in 1748. They were surprised to find that underneath a thick layer of dust and debris – Pompeii was mostly intact. 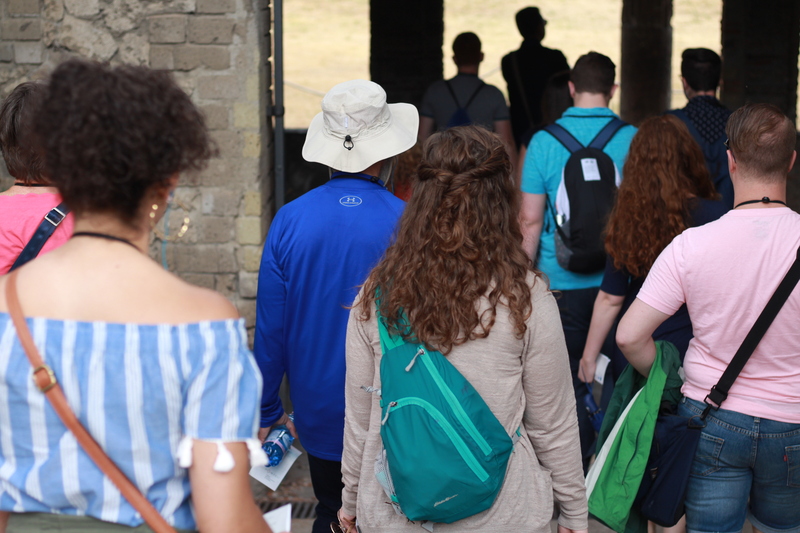 The buildings, artifacts and skeletons left behind in the buried city have given archeologists a great deal of information about the culture and life in the ancient world. 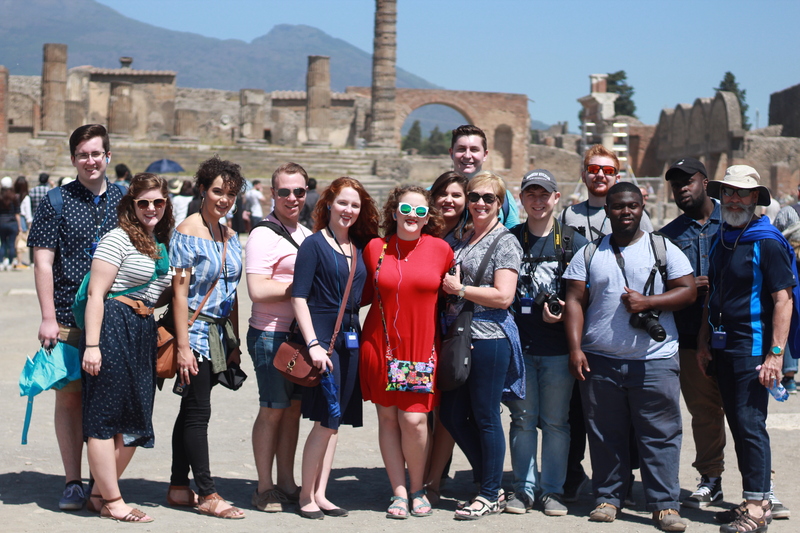 Visiting Pompeii today was an incredible experience for our team. Inside Pompeii are two amphitheaters. One was specifically for concerts and music. The second one was for dramas and plays. We sang inside the first amphitheater. Our voices carried throughout and was really cool to hear! The weather was absolutely beautiful today – with temps in the low 70’s. The sun was very hot so many of us put up our umbrellas to shield ourselves from the heat. 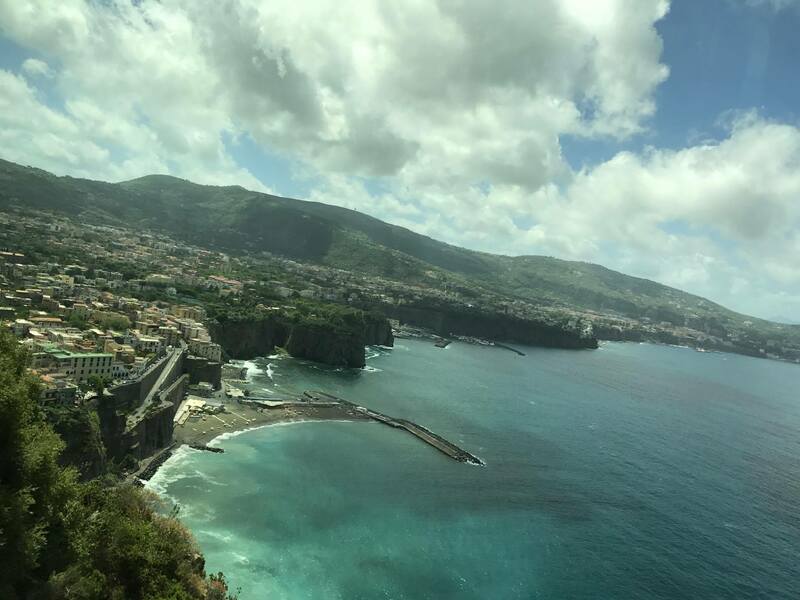 After our tour to Pompeii we got back on our bus and drove to the amazingly gorgeous city of Sorrento! Okay, now to say the views are breathtaking would be an understatement! This is a city high above the cliffs on the Tyrrhenian Sea. Driving in, we were passing lemon and orange trees, which if our bus windows were open we could have reached out and picked them! The purple bogenvilla is everywhere and grows up walls and hangs from fences. Wooden music boxes with beautiful inlay colors are the specialty of this town. Also beautifully woven linens are exquisite here. There is handmade pottery with lemons on it everywhere! Two years ago when we were here, we ate at a restaurant in Sorrento that was probably one of our favorite places to eat. We weren’t able to book it this year due to our schedule. When we left Pompeii our city guide asked if we wanted to eat in Pompeii or go to Sorrento to eat. We voted to go to Sorrento. He said he would arrange a place where could go all together that would serve pizza and pasta. It was so exciting when he guided us to the very restaurant we thought we wouldn’t be to go to at all!Ristorantetasso! Loved it! We sang for our servers afterwards and they clapped with delight. It’s such a small gift to give people, but a pleasure to do so. After our tour guide gave us our bearings, he asked if we would sing one more song for him before he departed. We were at an overlook at the sea, so we just arranged ourselves and sang “I Still Haven’t Found What I’m Looking For.” He was most appreciative and the crowd erupted with applause. It’s definitely not something you hear everyday. Shimmy made friends with a shop owner who baked cookies. So he was excited to share samples with us on the bus. The cookies were filled with lemon cream and chocolate cream. So delicious. Several bought jewelry and others bought some of the beautifully crafted wood inlay boxes. We had a show and tell time of our purchases on the way back to the hotel. Several said this was their favorite city so far! We are having dinner tonight at 7:30 and then we’ll be busy getting ourselves ready for tomorrow’s services. We are very excited to see some friends we met here before! In 2015 when we were here, Bob and I met the RP (religious programmer) for the Chaplain. He was a young man about 21 years old. In fact, he was who I contacted via FaceBook to see if we could come back to Naples Navy Support Base. And then he contacted the Chaplain on our behalf and that’s how we’re getting to be there tomorrow. I look forward to tomorrow’s events! Everyone is headed to bed early tonight since we have a 6:15 am call time tomorrow morning. P.S. … We had the bow tie pasta with salmon in cream sauce tonight for dinner!! YAY!! And there was morning and there was evening of the tenth day.